44 millions posts from 218,289 brands were analyzed from every country in the world. The time period of the study was 01 Jan 2018 - 30 April 2018 (4 Months). Please note that the findings of the study are based on this sample set of our Study. 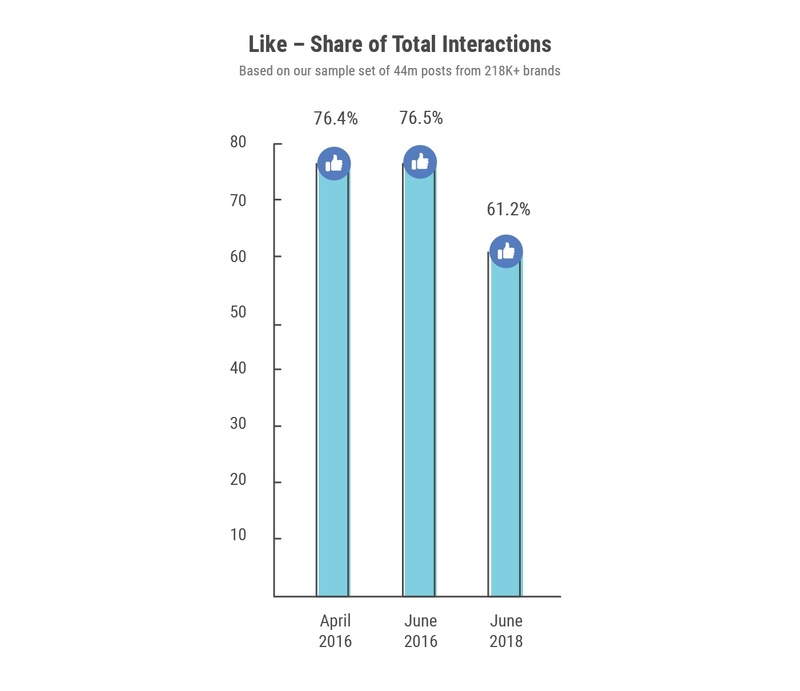 Eg: When we state "12.1% of all Interactions are likes " This means that 12% of all interactions in our Sample set (not entire Facebook's) are 'likes'. Tracking the usage of Facebook Interactions and ‘New Facebook Reactions’ all over the world. This study specifically looks into the usage from Jan 1st to April 30th. The first part is the average on a post level from 44 millions posts, which is later on expressed in terms of percentage. In the second part, we break down the usage of ‘new facebook reactions’ per post by countries. In order to make it comparable, we have used the average figures. Finally, in the last part, we have analyzed the usage of New Facebook reactions per post by categories (defined by facebook). 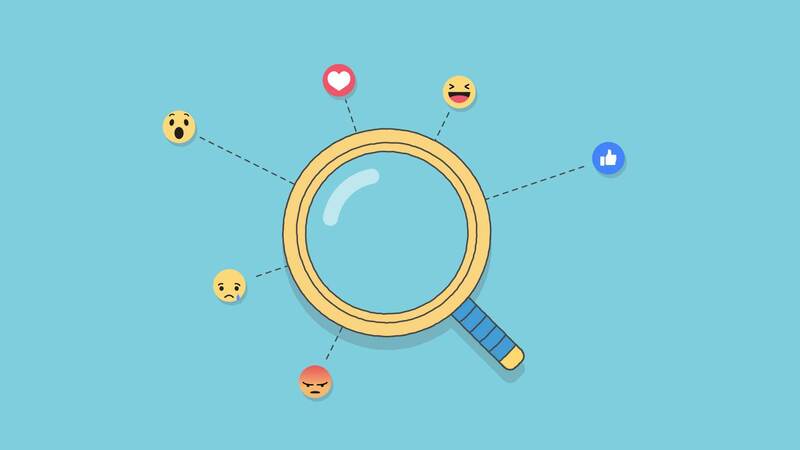 In early 2016, Facebook launched a new series of 'Reactions' in addition to the ever-popular 'Like' button, giving Facebook users even more ways to share a wider range of emotions on content across the network. Despite the significant launch of these new Reactions, which are mostly emoji-like faces (and one lovely heart), users seemingly didn't rush to use them. In fact, in our first Reactions study published April 2016, we found that only 2.4% of all interactions were either a ‘love’, ‘haha’, ‘angry’, ‘wow’ or ‘sad’. The good old Likes, shares and comments still took precedent, by far. Now, two years later, things have changed – considerably. First off, let's have a quick look at the Reactions to better define our focus here for the report. You know, in case you live on another planet and don't look at Facebook way too often like the rest of us do. As the most common touchpoint for interactions on the world's biggest social network, we wanted to provide some insights into the usage of these Facebook Reactions within a few different countries as well as multiple industries. Our findings potentially shed some light on some significant cultural differences and its effect on Facebook usage and even social media marketing. So, let’s jump straight into data. You might be surprised by what you see. 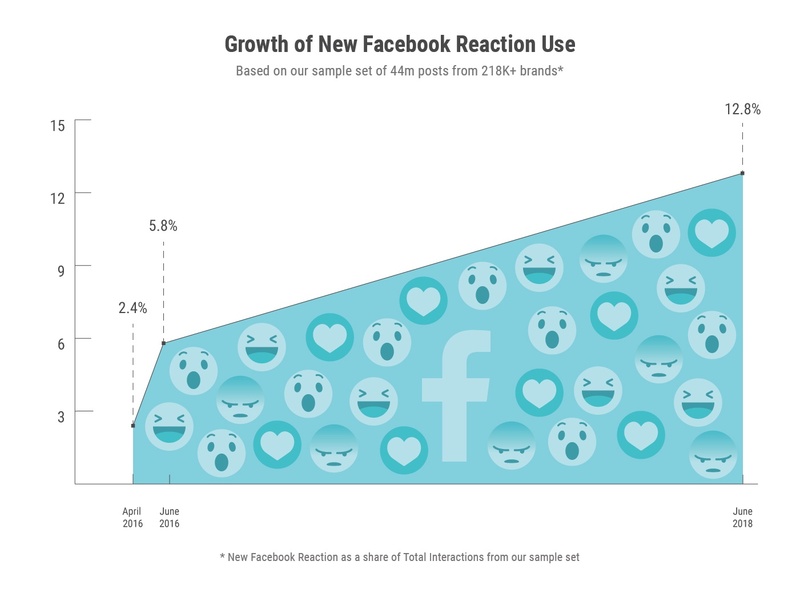 The use of new Facebook Reactions now makes up 12.8% of all interactions. 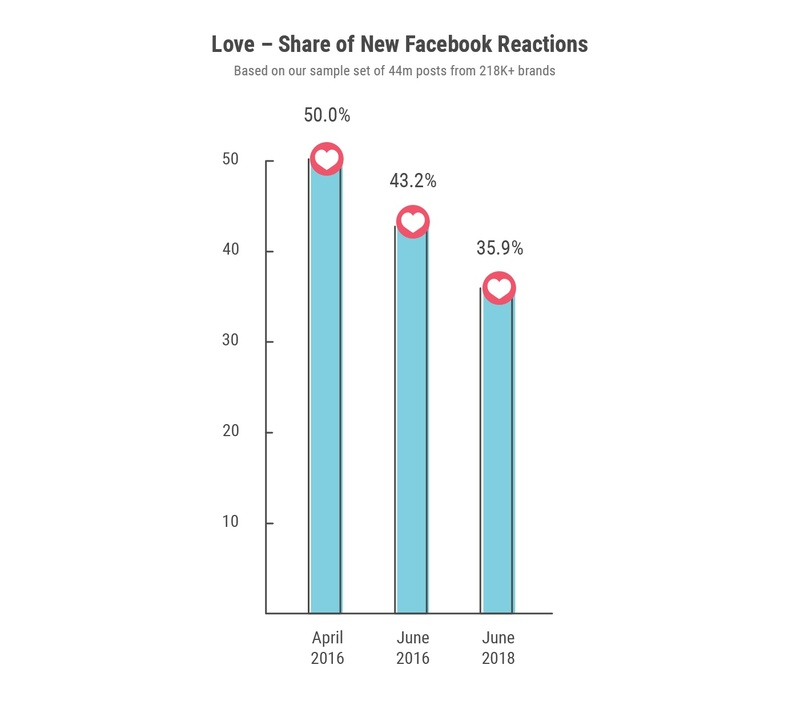 In our last similar study from June 2016, these new Facebook Reactions were making up 5.8% of total interactions, which was a decent increase from just two months prior in that first study of April 2016 – only 2.4% of interactions at the time. This shows Reactions usage grew quickly to start, relatively speaking, and has gone up steadily since. But still, that's a 433% increase in little over two years, since April 2016. It seems natural that Facebook users have been growing accustomed to the new Reactions over the last two years and enjoying the freedom to express their feelings in more ways as the network has continued to grow both in popularity and content. With almost 2.2 billion users on Facebook today, it's hard not to assume that the infinite scroll of personal, paid and media posts in peoples News Feeds hasn't had an influence on the increase of wider emotions expressed through Reactions. You could argue that aside from its logo, Facebook is most easily recognized by the iconic 'Like' button. However, it seems that trusty thumbs-up is getting less recognition these days due to the fact that Facebook users have found other ways to express their feelings more often. In addition to comments and shares, it's no doubt the growing use of newer Reactions is a cause for this. In that first reaction study from April 2016, the 'Like' accounted for 76.4% of all interactions and 76.5% in our second follow up study from June 2016. This is surprising considering the new Reactions use had already more than doubled in a two month time span. But this year? Well, things are a bit of a thumbs-down, with the percentage of 'Likes' having drastically decreased to 61.2%. At one point, 'Love' was the most commonly used of new Reactions. And according to our first study from April 2016, it actually accounted for 50% of the total new Reactions used. In the follow-up two months later, we found out that 'Love' was still the most used new Reaction but down to 43.2% while 'haha' had taken second place at 25.7%, overtaking 'angry'. Now, looking at the most recent data, we have found out that 'Love' is not getting as much love itself, as the usage is declining over time. Maybe laughter is the best medicine. The laughing 'Haha' has all but overtaken that lovely heart with “haha” making now 35.9% of total new Reactions used on Facebook – literally head-to-head with 'love' usage, which is down this year to 35.9%. Sharing is caring – but are comments more valuable? It's tough to say seeing as comparing the two is a bit difficult despite them both being counted as Facebook interactions. According to Kim & Ying (2016), between Likes, shares and comments, the 'Like' is the lowest level of behaviour for the platform as it just needs one click to register in comparison to writing comments or clicking through to share content. Both require extra commitment or cognitive effort. 'Share' is the highest level of behavior as it takes a couple steps for the user to accomplish before appearing on News Feeds as well as on their own profile page. In this sense, 'share' is even associated with self-presentation. With the academic research categorizing 'like" as the lowest and "share" as the highest level of behaviour, it also finds 'comments' as an intermediate. So while 'likes' should be easier to achieve, getting users to comment on your post can be somewhat of a challenge. But sharing is the holy grail for businesses and yet the most difficult to achieve from audiences. Suffice to say, sharing starts with posting great content that really entices Facebook users to take the content further. We wanted to evaluate the hypothesis of value between the big three interactions – shares, comments and likes. We found some contrasting results! 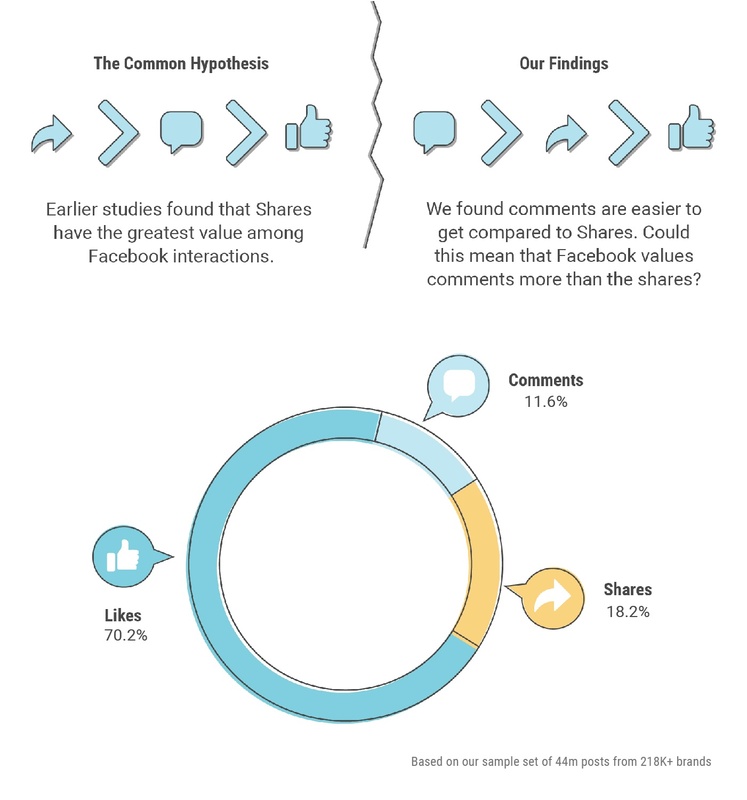 Marketers place higher value on "shares" than on "comments". Likewise, according to a study by Searchmetrics, Facebook shares have slightly higher correlation to Google organic ranking. Hence, in this regard, one would imagine that getting Facebook shares indeed would be difficult. Nevertheless, Facebook data tell us something different -Facebook users like to 'Share' more than commenting. Could this mean that Facebook now values comments more than shares? With an infinite range of sentiments expressed through comments, it could be hard to say. That's why the wider range of new Reactions provide an easier and more effective way to see how different demographics respond to content on Facebook. We decided to see how this plays into different countries across the globe. Mexicans are making extensive use of new Facebook Reactions buttons. They are on the top of the table with the number one spot for countries. 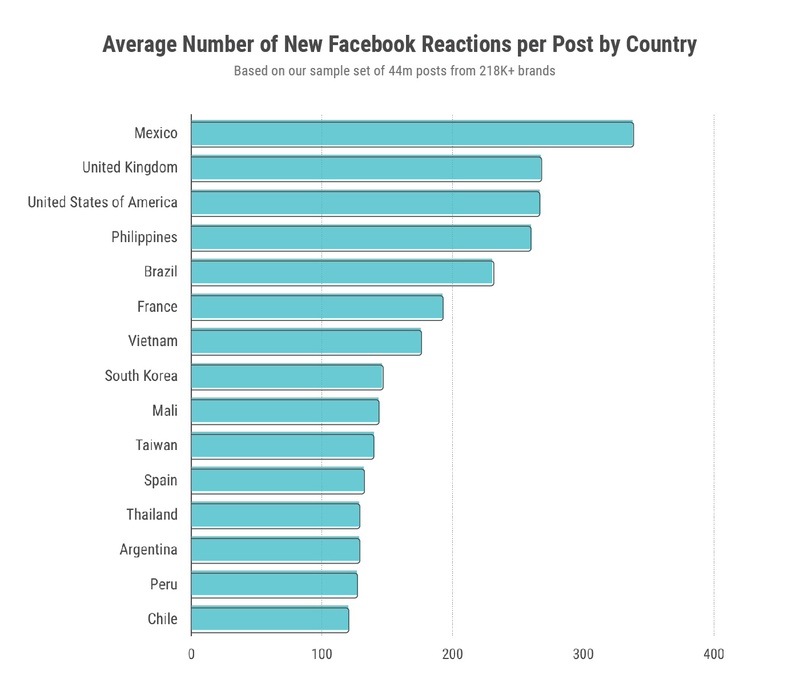 In Mexico, on average, 337 new Facebook Reactions per post are used. It's not all 'love' and laughs when it comes to Facebook Reactions. 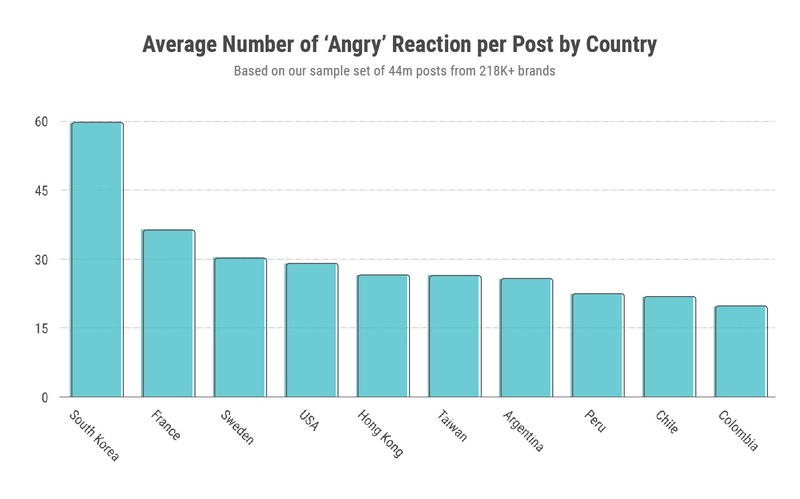 Some outsiders might be surprised to hear that of all countries, South Korea dominated for use of the 'angry' reaction on the social network. Recent turns of events in the country might help to explain this. The fire that engulfed Sejong Hospital in the city of Miryang was the deadliest fire in South Korea in a decade. It also came barely a month after another fire killed 29 people in December. According to nytimes, the public anger grew after what they perceived as a man-made disaster with the hospital not having fire sprinkler or smoke-control systems. Likewise, the government’s decision to form a joint women’s ice hockey team with North Korea for Winter Olympics mounted frustrations. Inevitably, things like this can lead to a certain degree of public outrage and user reactions to status updates and news articles being shared across Facebook. Even more difficult is to consider how truly tragic events can further influence a country's users on Facebook, as is the case with Afghanistan. The Intercontinental Hotel Kabul attack, Kabul ambulance bombing and other tragic events that took place in January and March of this year triggered the highest usage of the 'sad' reaction. It is both humbling and interesting to see that over time, new Facebook Reactions can become a method of measurement for such sensitive issues in societies. As a takeaway, when analyzing social media data, always remember that it's crucial to make use of additional data and information depending on regions or demographics in order to interpret the outcomes effectively. As you can see, the reason is that often real world events can significantly influence social media performance. At the risk of sounding too serious there, it's time we dive into a considerably lighter topic – categories on Facebook. Whether it's your favorite new puppy video or stand-up comedian, there are some major trends in new Reactions on these popular categories so we decided to take a look. The Facebook category “Animal” receives the most wide range of emotions in terms of Reactions (love, haha, wow, angry, sad). This makes sense as people are easily drawn to cute or funny animal content – I mean, who doesn't want to see a baby monkey riding on a pig? Studies have reported that humans have more empathy for dogs than people. Your grandmother, for instance, might be more likely to 'love' a cat meme on Facebook than posting your grade school photo. We don't actually have the data for the last point but it's just a guess. 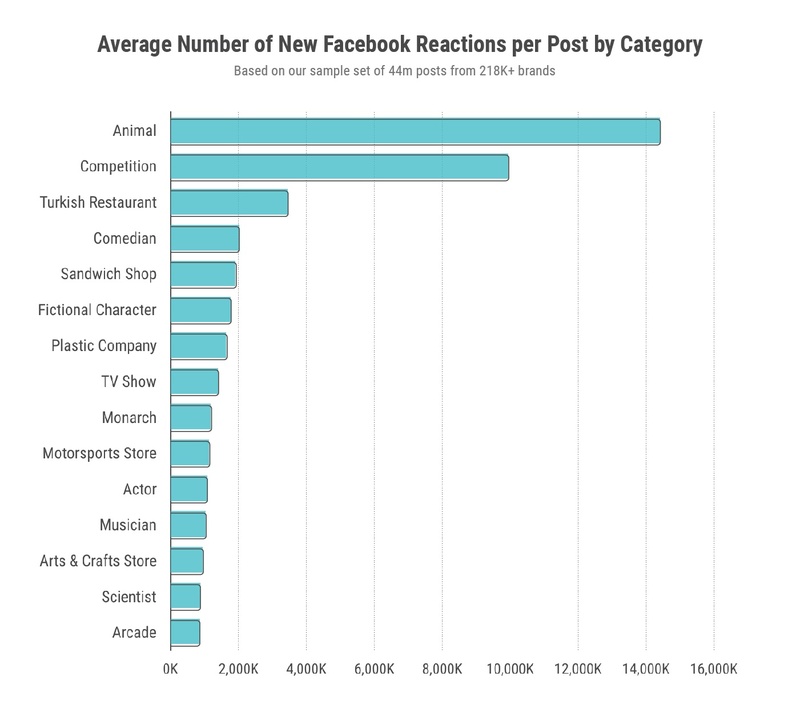 So it may come as no surprise, the probability of Facebook users showing more reactions (rather than just giving a 'Like') to the many millions of animal photos and videos is considerably higher than the other categories seen above. Without a doubt, the new Facebook Reactions are here to stay. Now more than two years since its introduction, Facebook users are using them more and more as they are grow accustomed to their place in the network's digital landscape. Some features on Facebook come and go or change over the years but the Reactions have proven themselves in a time when there is more content (and users) than ever, with steady growth that surely will continue to expand. Only time will tell what Facebook does to update its Reactions and even more, how users will use the platform to continue expressing sentiments to the flood of articles, updates and cat memes in their News Feeds. LinkedIn gets increasingly important - Ramp your LinkedIn up!